Whatever your Organisation needs to do next, start by stopping. 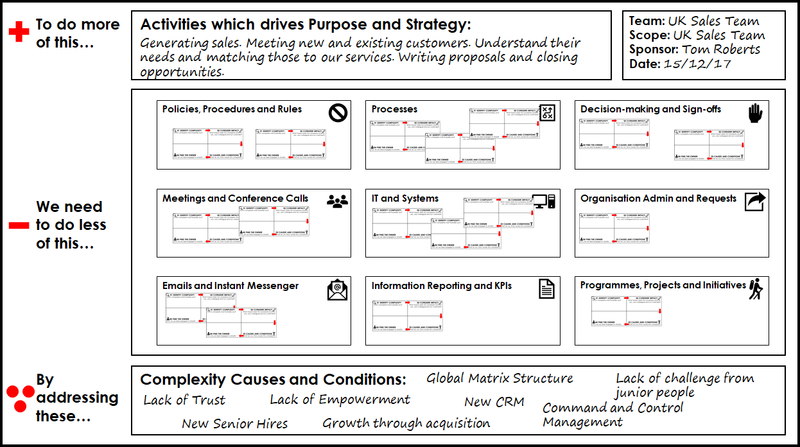 We’re excited to share The Killing Complexity Canvas, a 1-day intervention designed to help organisations solve the growing problem of internal complexity. The Canvas enables Organisations to simplify how they work and create more space for activities which contribute to Purpose (the Organisation’s reason for existing) and Strategy (how the Organisation achieves its Purpose). The Canvas is based on our experience working with the likes of Action for Children, Aviva, AXA, Bank of America, easyJet, SAP and Telefonica. We believe unnecessary internal complexity is blocking organisations from doing bigger and better things, especially innovation. A lot is written about complexity. But far less is written about simplicity and how to achieve it. Unlike Lean or Systems Thinking, there’s no established simplicity playbook. So, we’ve made the Canvas open source for all to imitate. The following pages outline our thinking. Click on the headings to explore more. The Canvas has been designed to be used by Teams, Functions, Business Units or even by an entire Organisation. For a 40-person company, you’d probably run the Canvas for the entire Organisation. For a large multinational, you’d use the Canvas across multiple teams in various Functions and Business Units. A short online survey (Scouting Complexity Survey) can also be used to source examples from a wider audience. 01. What is Simplicity and Complexity? *As an illustration, 12 people working 40 hours a week equals 480 hours a week, 1,920 hours a month and 23,040 a year (assumes 48 working weeks a year). How many hours are lost to internal complexity? Our experience says somewhere between 15% – 25%, which in this case is 3,456 – 5,760 hours per year. Participants are asked to attach activities which create optimal value to the Canvas. This is what this group is seeking to maximise. Complexity, and the low value work it creates, is categorised into nine areas. For each of the nine areas, participants are asked for examples of what could be simpler and for examples of what currently works well. (By addressing these) Complexity Causes and Conditions. Later in the workshop, the group captures what is creating the complexity. Outcome: Participants share, agree and pinpoint frustrating, time consuming internal complexity by placing real-life examples onto the Canvas. – Simplicity Habits: Saying no! ; Why, why, why? ; Not tinkering, Not reinventing, What could be simpler? A group of 12 people will create 12 – 24 simplicity experiments. In 8 weeks, participants will report on their progress. We delivered a version of the canvas (two half days, rather than one whole day) at global telecoms giant Telefonica. The first cohort of 15 managers worked on simplicity sprints which delivered a total 17,130 hours in the next 12 months. This time was reinvested for innovation. Wide-reaching organisational complexity such inter-department meetings, use of email, a new product development process and KPI reporting were all simplified. “Stop. are the real deal – flexible, fun and thought leading. Most importantly, they get results. Our Managers created over 1,000 hours per year each by simplifying frustrating and time wasting organisational complexity”. Internal complexity is visible in Organisations as low value work. We’ve yet to find an organisation which is optimally simple. By that, we mean time, money and talent is optimally deployed to those activities which create the most value in achieving Purpose and driving Strategy. Organisations are awash with complexity and the low value work this creates. This complexity blocks innovation, slows growth, decreases agility and disengages people. Complexity creates drag and friction. It distracts time, money and talent. It can be hard to pinpoint and hard to measure, but we all feel it. PWC estimate that 30% of all frontline staff time is spent on non-value adding activity. Multiple meetings. Many people, little purpose and even less outcome. MegaByte. Very similar but altogether different IT Systems. Another new initiative. Start but don’t always stick. New things are added without old things being taken away. All change. Amended or new policies, procedures, rules and structures. Protracted processes. Not easy to get even the most basic things done. Busyness. Frustrated, hard-working people spinning wheels. Excess email. Overflowing inboxes, with CC’ing, BCC’ing and FYI’ing. Analysis Paralysis. Copious KPIs and rambling reports. No standard. Different ways of doing the same things. Everything’s a priority. Trying to do too many ‘strategic’ things. Decisively indecisive. Slow sign-offs and decision-making. Status quo conformity. “It’s always been like this”, “We’re just complex”. If you recognise in these your Organisation, you likely have an internal complexity problem. Your organisation is wasting opportunities to be doing bigger, better things. The research is unequivocal: complexity is growing. BCG calculated this average increase to be 6.7% a year over the last 50 years. In a rapidly changing world, speed really matters. The pace of change will never be as slow as it is today. Dropbox, Instagram and Uber are just three examples of billion-dollar businesses setup in the less than 15 years. Speed allows organisations to innovate more, grow quicker and change faster. But complexity and speed do not co-occur. Complexity is an antonym for speed. Complexity is the drag which slows an object down, or the cholesterol which slowly builds up inside the bloodstream undetected. Inspired by our friends at The Ready, internal complexity can be viewed as a future tax. If complexity costs the organisation more in time, money or talent than it generates in value – intervention is needed. A complexity tax has a current cost (time, money or talent to complete the activity) and a future cost (the future value of the highest value activity the organisation could have been doing). The bigger the organisation, the bigger the complexity tax. 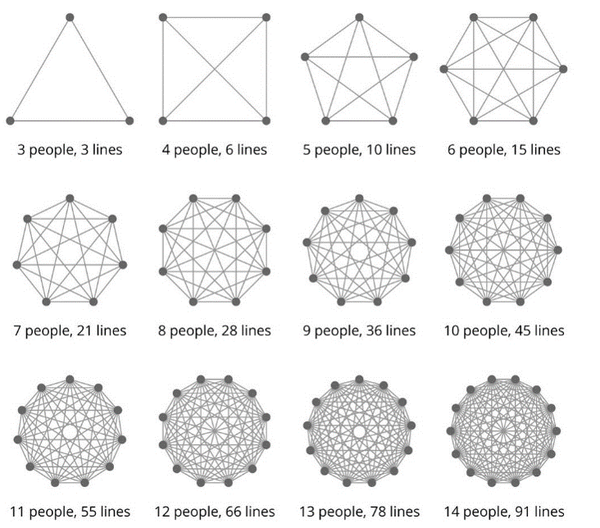 Complexity creates diseconomies of scale. The more moving parts there are in an organisation, the more complexity there is. Consistent with BCG’s research, thinking guru Edward de Bono remarked there’s never a natural evolution to simplicity. Without intervention, all organisations, including yours, will naturally become more complex. If the business case (and common sense) is so obvious, just why does complexity prevail in the Organisations we’re all a part of? Complex is easier than simple. Complex has become the status quo. In a complex world, our solution to complexity is complexity. Complexity happens automatically, whilst simplicity requires a concerted effort. A bi-product of change and growth is complexity. In fact, complexity can often be a consequence of success. Organisations are full of people, and people are hardwired to create complexity. It would be easy to assume that such an increase in complexity is due to a rapidly changing world. Whilst that’s clearly a factor, BCG found that complexity generated inside organisations is growing six times quicker than complexity generated externally. No wonder 94% of Executives polled by Bain & Co in Organisations with over $5bn in sales say it’s internal complexity which is preventing growth, not competitive threats or a lack of opportunities. 87% feel psychological safety in expressing their opinion (vs. 38% in complex organisations). Worryingly, and perhaps unsurprisingly, they found only 2% of people in complex workplaces find it easy to innovate. Complexity appears for a multitude of reasons. We group these by contextual, structural and cultural factors. Contextual factors include the market the organisation plays in, how the organisation has grown or changed through, for example, M&A activity, and whether the industry is regulated. Structural factors include how the organisation is designed, what technology it uses and what data it has available. Organisation designs are largely unchanged from Frederick Taylor’s time when thinking was separated from doing. The knowledge-based workforce and access to infinite data make these designs less relevant. Changing contexts are addressed with new data, new teams, new processes, and new rules. However, more often than not, complexity manifests from culture. Complexity is created, usually with good intent, by our human makeup. As a race, we’ve progressed and survived by adapting, adding, advancing, creating and inventing things. Similarly, people have progressed and ‘survived’ in organisations for the same reasons, even if improving things can actually do more harm than good. Specifically, the way people think (mindsets), behave (behaviours) and act (habits) create complexity. We all have a duty to consider how the way we think (mindsets), behave (behaviours) and act (habits) creates complexity. Leaders and Managers set the tone. And there’s work to do. Wharton Business School found that only 27% employees believe the day-to-day actions of senior leaders represented simplicity. Those Organisations who decide to consciously remove unnecessary complexity rather than suffer it perform better. Much, much better. Quite simply, to reduce complexity is to reduce activity. 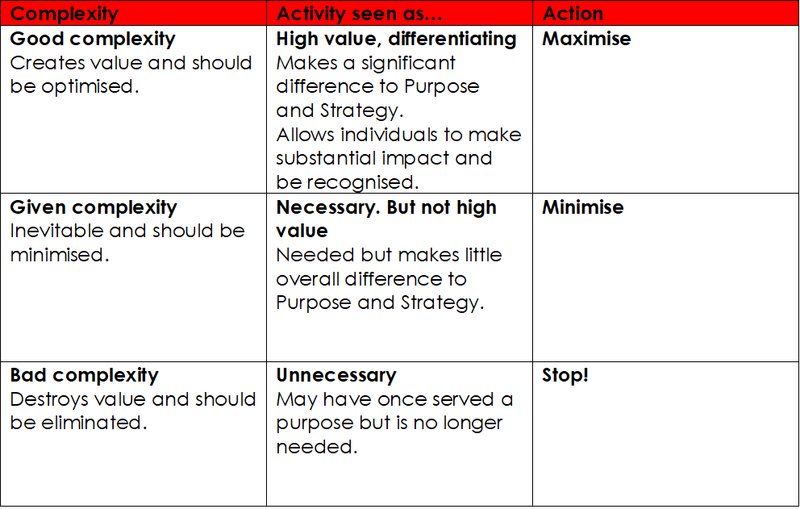 Complexity which causes low value activity needs to be minimalised. Minimalised means taking away time, money, and talent. An obvious word of caution: not all complexity is bad. In fact, some complexity creates competitive advantage and should be harnessed. For example, when British Airways recently introduced a new route to New Orleans, it did so because it will serve its customers and make money. BA’s route planning team would have undertaken high value activity to reach this decision. Similarly, Apple introducing the Apple Watch and Facebook acquiring Instagram created value creating complexity. If in doubt, simplify everything. Why have we designed the Canvas this way? Over the last 4 years, we’ve been working with the likes of AXA, Time Inc. and Telefonica to simplify how they work. Our work has varied from diagnosing operating model complexity, to running simplicity hackathons, to equipping managers and leaders to simplify how their teams work. Define complexity. Clearly define what complexity is and what it is not. Organisations who look at complexity through a lens of what happens every day (i.e. activity) have more success. Set a goal. Provide an aspiration and purpose for simplicity – don’t simplify for simplicity’s sake. The goals can be time (hours saved), monetary (hours -> cost), opportunities (what we can now do) or engagement (frustration levels). Engage everyone. All employees feel complexity, (especially) not just Leaders – who can have a biased view. Invite people to share the specific complexity which frustrates them and gets in the way of their job. Quantify complexity. If you can’t quantify complexity, you’ll be hard pressed to remove it. Use a simple method for valuing complexity. We recommend measuring time (hours/month), which can be converted to cost, and levels of frustration. Understand real causes and conditions. Unless you uncover the real drivers of complexity, simplicity solutions will be short lived. We suggest using tools from Systems Thinking and Lean. Simplify through Sprints. Don’t rely on a big transformation programme to eliminate complexity. Unless they’re specifically designed to kill complexity, transformation programmes can create everyday complexity. Get creative and re-design complexity for simplicity in short, sharp experiments. We suggest using inspiration from Design Thinking. Everyone experiments. Empower people to disrupt their status quo, innovate and test simplicity in day-to-day work. Encourage everyone to ask: ‘how can this be simpler?’. Measure impact, celebrate success. If you can quantify the pain of complexity, you can measure the benefits of simplicity. Sustain simplicity by rewarding those who make it so. Change what people think and do. There’s a need to understand and change the mindsets, behaviours and habits which create complexity. Similarly, there are mindsets, behaviours and habits which safeguard simplicity. And repeat… Simplicity is a perpetual process which needs to be repeated regularly. So, like you Spring clean your home, so you need to build simplicity into your Organisation’s rhythm. When developing the Canvas, we’ve consciously had to park some of the principles learnt from being trained as management consultants. For example, the nine complexity categories are not necessarily Mutually Exclusive and Collectively Exhaustive (MECE). A sales report in one organisation may be created in Salesforce (IT and Systems) but in another organisation covered verbally in a sales meeting (Meetings and Conference Calls). Similarly, there are emerging schools of thought on how you define and solve for complexity. Traditional problem-solving methods such as Lean get micro and zone in on specific linear root causes, without always considering the much bigger picture. The consequence is contained problem-solving where solutions to the local issue can cause bigger problems elsewhere, or real root causes are not fully understood. Systems Thinking is growing in popularity. It encourages a much more holistic view of all factors (system conditions) contributing to a problem. Whilst it’s pure, it’s not always easy to define the system in scope, let alone identify and influence all factors. Additionally, Systems Thinking assumes some degree of causality. Systems conditions are rapidly changing and interconnected, so getting a useful, stable view of these conditions is difficult. More recently, Complexity Thinking has emerged through academics such as Dave Snowden and Ralph Stacey. Complexity Thinking embraces uncertainty, unpredictability and complexity as inevitable. It encourages ‘dexterous thinking’ and guards against using a set methodology. Home Depot. Store managers were supplied with an ‘anti-bullsh*t’ stamp which they could use on overly bureaucratic requests from HQ. Amazon: Jeff Bezos initiated the 2-pizza rule: if you cannot feed everyone in a meeting with 2 pizzas, there are too many people. Adobe: After calculating it cost 1.8m hours a year, Adobe scrapped the formal performance management process. Ferrari: A Computer plug-in stops employees sending the same internal email to more than three colleagues. Pfizer: Pfizerworks was set up for scientists and engineers as a function to outsource basic, time-consuming administration. General Electric: Off plan decisions were simplified to 2 signs-offs. Your boss and your boss’s boss. Boots: The first step to simplify management reporting was to stop sending reports altogether. Who complained? Not as many people as assumed. The result was a reduction in management reports from 206 to 48. BBC: The Director General introduced a culture change programme called ‘Show bureaucracy the red card’. Any member of staff could brandish a red card to challenge anything they saw as bureaucratic. Stop sending management reports for 1 or 2 periods. What happens? ‘What if’ challenges. If we had to achieve this outcome with 50% of people, cost or time, how would we design it? Some organisations have delivered extraordinary programmes which have killed complexity and delivered simplicity. Below we’ve summarised four we found inspiring. GE created the Work-Out, a 1 – 3-day bureaucracy busting hackathon. Work-Out was mandated for each Business Unit and Function, giving a consistent approach for systemically removing complexity. CEO Jack Welch celebrated and promoted the champions of Work-Out. There were consequences for non-cooperation. Welch proved simplicity can be accelerated if you bring together the right people, ask the right questions and expect a progress in 30 – 90 days. Outcome: When Welch arrived at GE in 1981 it was worth $14bn. When he left in 2001 it was worth $410bn. General Motors, Wal-Mart, IBM, Phillips, Home Depot, Sears and Unilever have all imitated the approach. Steve Jobs was a personal evangelist of simplicity. Jobs was adamant culture was the key to removing complexity, not process. Every day Jobs asked his Executive Team: “What have you said no to today?”. Jobs used a symbolic ‘simplicity stick’ to ‘hit’ employees when he saw complexity at Apple. When in a meeting room, Jobs would demand from attendees: ‘Why are you here? What could you be doing?’. Outcome: In 2011, Apple became the most valuable firm in the world, overtaking Exxon. 10 years earlier, Apple was ranked 287 on the S&P500. AZ wanted to create time for growth by stopping and simplifying low value activity. Setting a simple stretch goal of 1 million hours/year (= 550 FTEs) focused everyone and ensured progress could be measured. AZ realised simplification required new capability, so people were given a toolkit to guide them. The toolkit was rolled out by a group of simplicity champions. Outcome: 12 months after the programme started, 700 simplification projects have resulted in more than 2 million hours a year being saved. Bayer appointed a Global Head of Complexity Reduction to lead all simplicity efforts. They mandated a 1-day complexity reduction workshop for their top 1,000 Leaders. 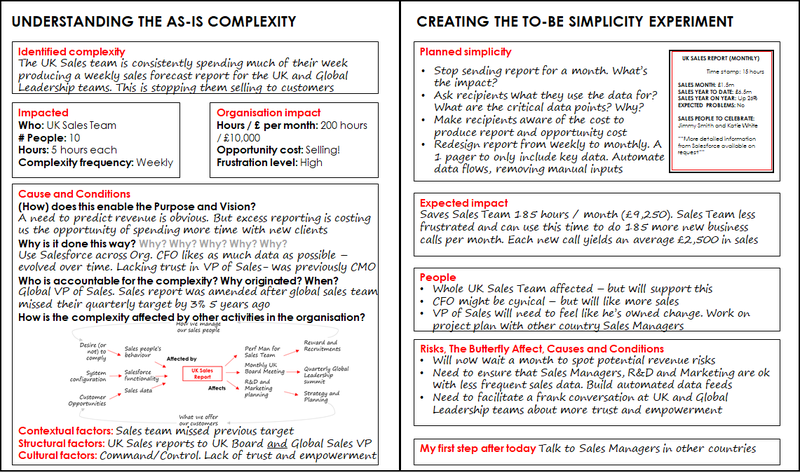 A toolkit focused on solving real complexity issues identified by direct reports. What’s more, all Leaders had a tangible complexity reduction goal in their formal performance goals. Outcome: 1,150 simplicity projects which reduced €450m in direct costs and freed up €600m in time. Simplicity programmes have a mixed track record of success. Many start with great intent. But after a big bang launch employees are barely able to notice a difference. Causes and conditions are not properly understood, so solutions are designed for symptoms. Genuine simplicity requires senior people to change the mindsets, behaviours and habits which have made them successful. Simplicity is hard, it’s not natural and it requires discipline. But as Steve Jobs famously once said “Simple can be harder than complex. But it’s worth it in the end. Because once you get there, you can move mountains”. If you’re interested in learning from others on the topic, please see our recommended simplicity reading list. What did 7,000 HBR readers say about bureaucracy (complexity)? And what should you do about it?